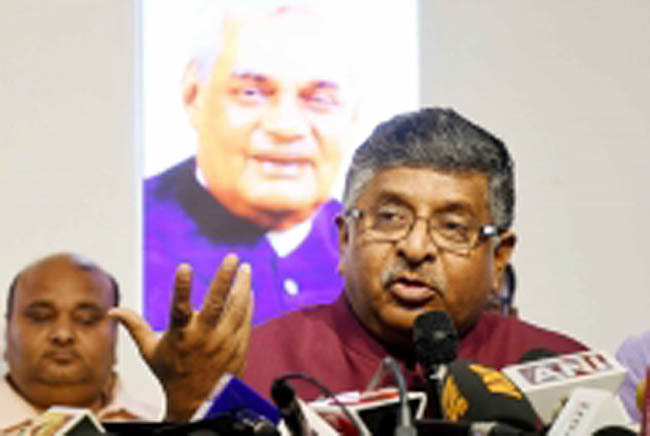 Patna, April 3 (IANS) Union Minister Ravi Shankar Prasad, who is the BJP candidate for Patna Sahib Lok Sabha seat, on Wednesday said the opposition Congress party is standing with those against the country. Prasad has been fielded by the BJP from Patna Sahib after the party denied the ticket to the sitting MP actor-turned-politicuan Shatrughan Sinha. "Congress has been supporting and standing with Tukde-Tukde gang and Congress manifesto is to divide the country, and will give relax to hearts of those against the country" Prasad said here. He said that the Congress is doing everything to demoralise the army and security forces. The Union Minister also asked the Congress to spell out how many jobs were given by the previous UPA government at the Centre during its 10 years in power. The NDA government is giving fitting response to terrorists and Pakistan, Prasad added.